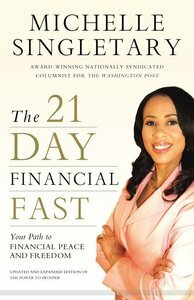 In The 21-Day Financial Fast, award-winning writer and Washington Post columnist Michelle Singletary has a field-tested financial challenge for you. For twenty-one days, you will put away your credit cards and buy only what you need to survive. With Michelle's guidance during this three-week financial fast, you'll discover how to: Break bad spending habits Plot a course to become debt-free with the Debt Dash Plan Avoid the temptation of overspending for college Learn how to prepare their elderly relatives and themselves for future long-term care expenses Be prepared for any contingency with a Life Happens Fund Stop worrying about money and find the priceless power of financial peace As you discover practical ways to achieve financial freedom, you'll experience something even more amazing---your faith and generosity will increase as well. About "The 21-Day Financial Fast"
Customer Reviews For "The 21-Day Financial Fast"
The idea of a 21 day financial fast is fantastic. It really shows you what is important and how you can live without so many of the things we mindlessly buy. So the concept and discipline of doing the fast is brilliant. But I had a mixed reaction to the principles she outlines for managing money beyond the fast. Some of them are really sensible (e.g. having a realistic budget, putting aside savings, being generous) but at other times I thought how she discussed the principles was extreme, legalistic or too black and white (e.g. all debt is bad, you must tithe 10% of your gross income with offerings on top of this). For those who aren't great at managing their money this book will be life changing. For those who are already good with money they may already be living many of these principles, but it is still a reminder to challenge our thinking about and use of money.